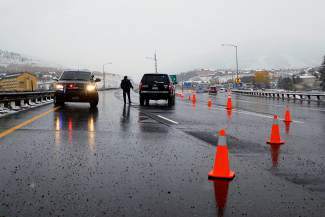 Officers from the Silverthorne Police Department mark a road closure at the Interstate 70 exit in Silverthorne on Sunday, Oct. 12, 2014, around 11 a.m. CDOT closed I-70 between Silverthorne and the Eisenhower Tunnel at least twice Sunday due to several vehicle spinouts and minor accidents. CDOT reopened Interstate 70 from Silverthorne to the Eisenhower Tunnel around noon and Vail Pass in both directions by 1:15 p.m. after closing those portions of the interstate Sunday morning. CDOT Region 3 spokeswoman Tracy Trulove warned people to be safe on the roads Sunday after snow and icy conditions caused multiple vehicle spinouts and minor accidents. 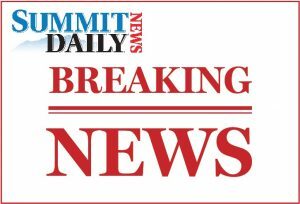 CDOT closed I-70 between Silverthorne and the Eisenhower Tunnel twice for about an hour each time Sunday while accidents were cleared. Highway 9 around Hoosier Pass also experienced an hour-long closure for the same reason. The closures marked a seasonal milestone as the winter storm caused the first weather-related delays and reminded those who haven’t already to check their tire tread and switch to snow tires. According to the National Weather Service, the storm should be gone by Monday and the rest of the week calls for mostly sunny skies. Monday’s high temperature will be in the low 40s, and after that expect highs in the upper 50s.